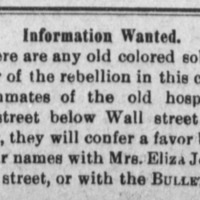 They ran into each other in 1867. From Fleming County, Kentucky. 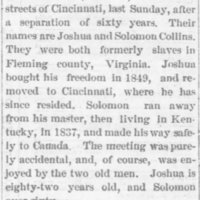 Joshua bought his freedom in 1849. Solomon escaped to Canada in 1837. 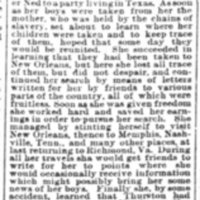 Corkley, a Louisville, Kentucky, railroad porter, found his mother in Louisiana. She was sold away from him when he was a year old. 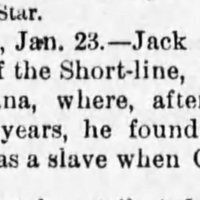 They were separated, in Kentucky, by sale 37 years earlier [ca 1849]. 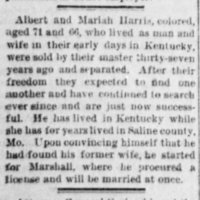 Albert Harris found his wife after searching since the Civil War. Cobble found her sons, Thurston Cobble and Ned Cobble. 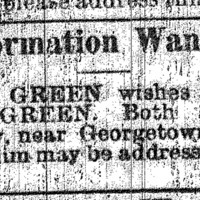 They were sold to a New Orleans slave trader in Richmond, VA, 40 years earlier, in 1849, to fund slaveholder's trip to gold rush California. 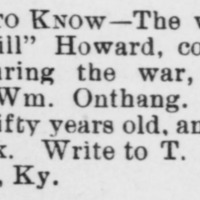 Watson, 79th Regiment, Louisiana Colored Infantry, Civil War, has not hear from his family since they arrived in Louisville, KY, summer 1865. 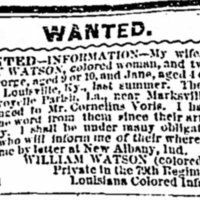 They all "belonged to" Mr. Cornelius Voris, near Marksville, LA, before the Civil War. Tags: Army hospital- Maysville KY, Civil War, Kentucky, Maysville KY, Pensions (Civil War) ? Wm. 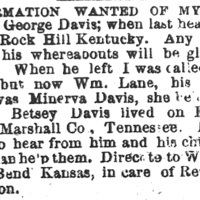 (Perry) Lane searching for his stepson George Davis.